Storms are once again rolling through southwestern Tennessee tonight, and actually, we need the rain. Over the last five or six weeks, we’ve had several strong storms come through, and the way we have had our awning anchored had proven secure. However, there was a twist in tonight’s storm that challenged our preparations. Sudden loud noises had both of us heading to the door. Jim moved outside; the wind catching the door and slamming it against the left arm of the awning and the side of the camper. 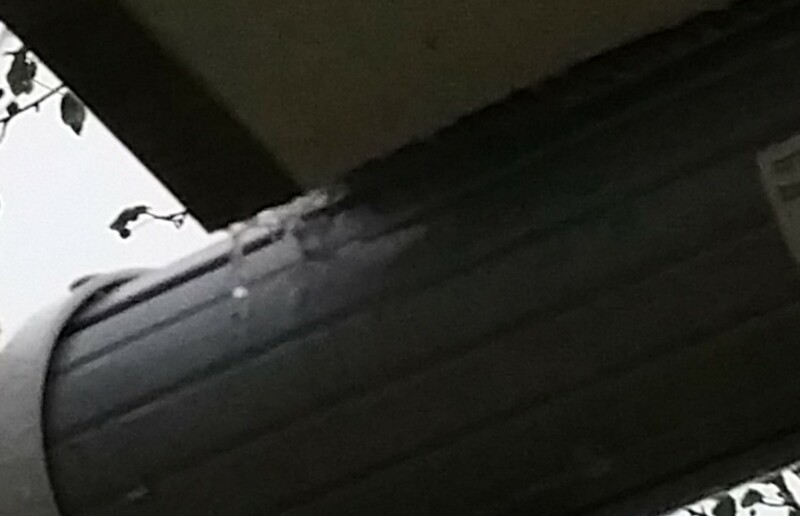 Part of the tree in front of our site had broken off and had fallen onto the the left side of our awning. 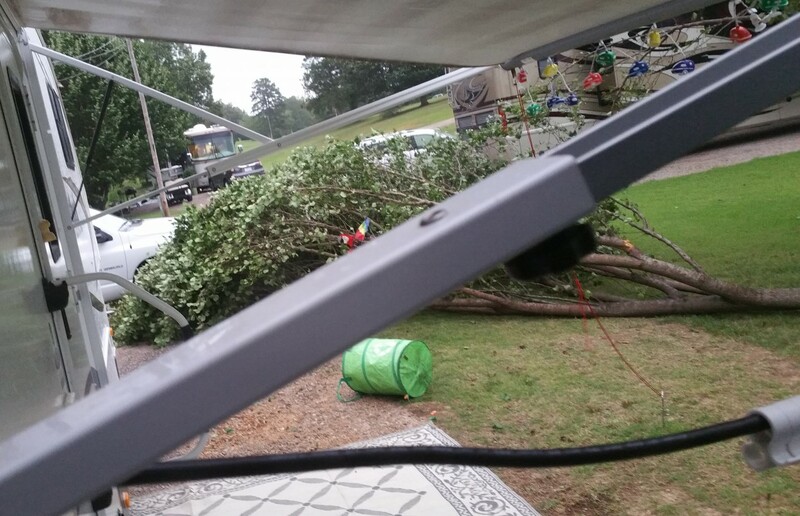 Quickly, Jim pushed the large section of tree off the awning, but it was too late to prevent damage. The weight of the tree plopping down on the left side of the awning tore the awning slightly on that end, but it also caused an opposite reaction on the right side. The tab through which we had secured our anchored rope that held the awning in place was ripped apart. 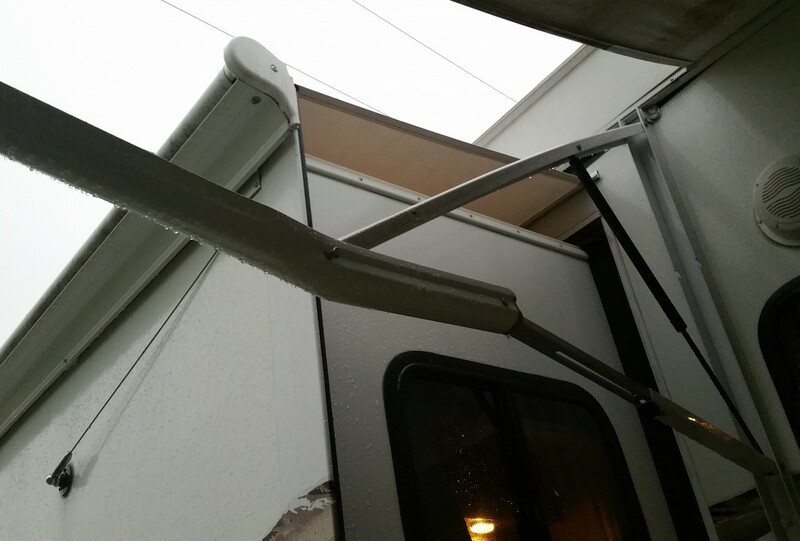 Heavy wind then caught the right side of the awning, pulling it up and bending the arm on that side – all of these things had happened at once. We weren’t sure what to do, but we knew we had to act, though it was still storming, to prevent further damage. Jim climbed up on the ladder and held the now bent arm of the awning down while I worked to untie the knots in our rope. Once that was done, we rushed to loop the rope over the metal arm of the awning and secure it to our anchor to hold it down. As we hurried through this process, Jim and I heard a cracking sound coming from the tree. Fearing another section might fall, I was anxious to get the job completed and get back inside. Jim and I had discussed bringing the awning in about 20 minutes prior to all of this. With the success of our set up holding through worse storms than what was expected tonight, we did not. I was beginning to chastise myself for not insisting that we bring the awning in this time, but then I realized that had we brought the awning in, the section of the tree most likely would have fallen straight into the side of the camper, potentially causing more damage than we currently have. 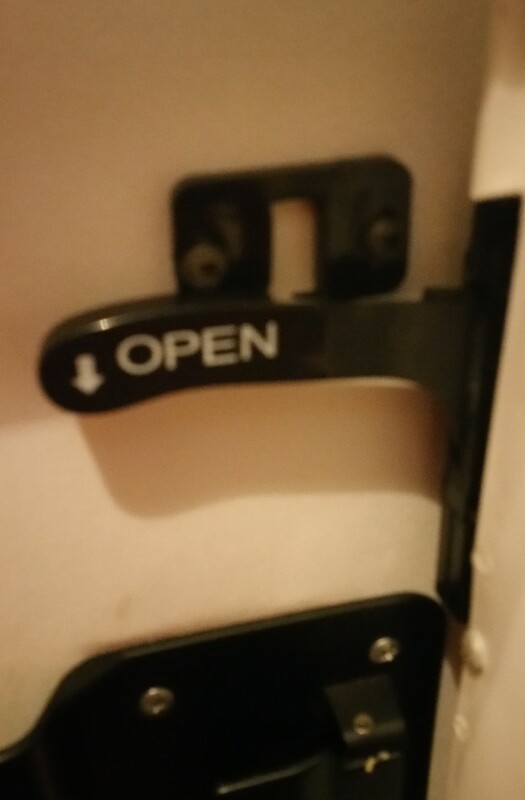 We discovered, as we attempted to get back inside the RV, that the wind catching the door caused the latch that secures the storm door to the outside door to break, too,. 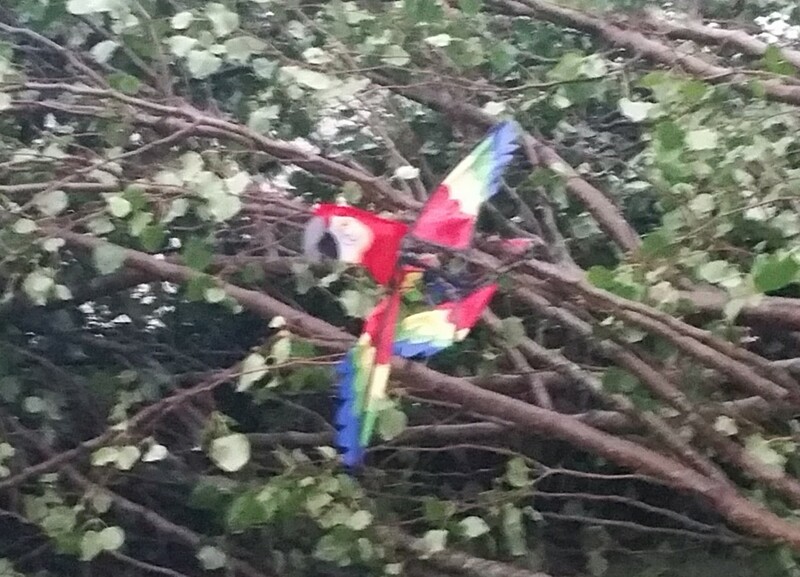 I’m not sure as of yet if our recycling container was damaged, but I am sorry to announce that it appears we have lost Mac, our yard Macaw; he took a direct hit from the tree, and we can see him in the its limbs. Hopefully, we’ll survive the rest of the series of storms tonight and tomorrow without further damage, and then we’ll evaluate what needs to be done to repair or replace as required. 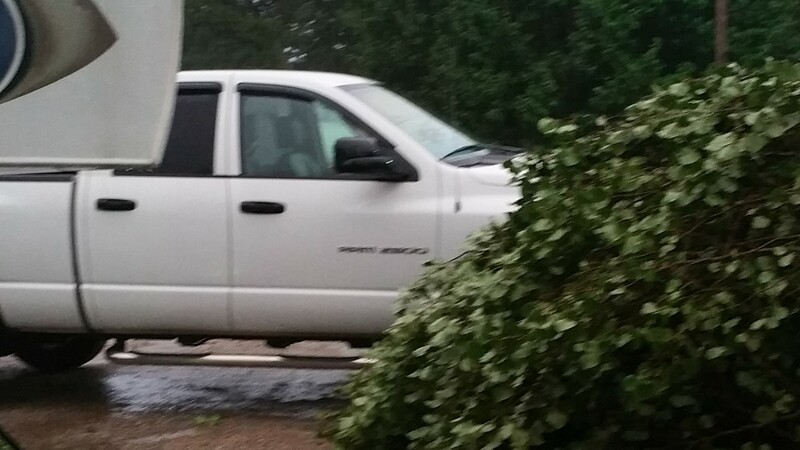 We’re very lucky the tree did not hit the truck (it came oh so close). It is also good that the car was not pulled up as far as it often is because it may have been hit, too. If this is the worst of it, we’re okay.